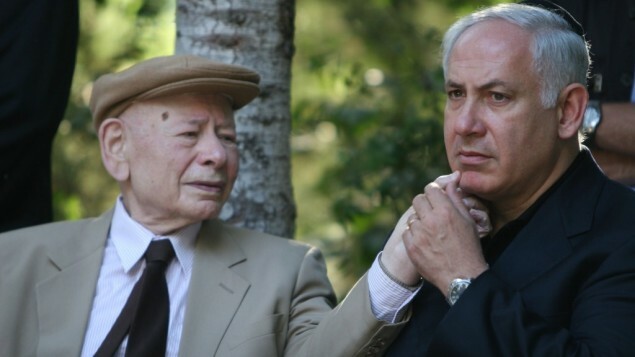 FATHER OF ISRAELI PRIME MINISTER NETANYAHU, BENZION, PASSED AWAY AT 102 YEARS OF AGE……. – The Tundra Tabloids……. FATHER OF ISRAELI PRIME MINISTER NETANYAHU, BENZION, PASSED AWAY AT 102 YEARS OF AGE……. Prof. Benzion Netanyahu, the father of Prime Minister Benjamin Netanyahu, died Monday morning in Jerusalem at the age of 102. A doctor working for the Prime Minister’s Office confirmed the death. The funeral was scheduled for 5 p.m. Monday at Jerusalem’s Har Hamenuchot cemetery. Netanyahu, a writer and professor of Jewish-Spanish history, was seen as a major influence on the prime minister’s world view. He was considered one of the world’s foremost experts on Jewish life in Spain in the Middle Ages. He was also editor of the Encyclopedia Hebraica. President Shimon Peres said Netanyahu was “a great historian and a great Jew.” Speaking at a school, Peres had the students stand for a moment of silence in his memory. Previous Post Previous Post 20% OF AMERICAN YOUTH UNEMPLOYED, NOW SAYING THAT THEY’RE DONE WITH OBAMA……..
Next Post Next Post IRANIAN NAVY BOAST NAVAL PROJECTION OFF OF U.S. COAST……. Thanks Steve, I have published earlier on this jerk, and will keep your link (with H/T to You) and use it later in another article. Many thanks. Benzion Netanyahu wrote some excellent books. Very sad that he has passed away. OT: btw KGS, that whole filterthing for commenting on the TT is downright scary 😉 He told me to ‘drag the knife to the bathroom’.